Roger Dann DS19, Harvey Mansfield DS21, and Robert Dann DS19 (or is it Robert, Harvey, and Roger? 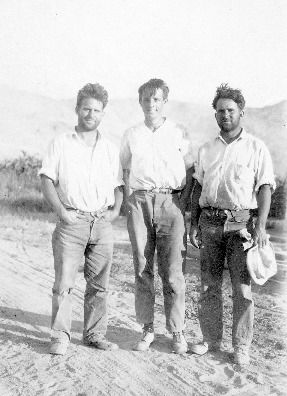 ), perhaps just returned from a trip, which would account for the seldom-seen beards on students of this time - the styles in this image, like some others around this era, have a curiously post-2000 flavor to them, or maybe it was just a stylish time at Deep Springs, so you notice it. unknown, “Harvey Mansfield and the Dann twins,” Deep Springs Archive, accessed April 22, 2019, http://archive.deepsprings.edu/items/show/1535.